The Los Angeles Lakers head to EnergySolutions Arena in Salt Lake City to take on the Jazz on Friday. The Lakers are 4-1-1 against the spread in their last 6 games vs. a team with a winning % below .400. They are 3-1-2 ATS in their last 6 games vs. a team with a losing straight up record and are 13-5-1 ATS in their last 19 road games vs. a team with a losing home record. The under is 6-0 in LA's last 6 overall and is 5-0 in their last 5 road games. 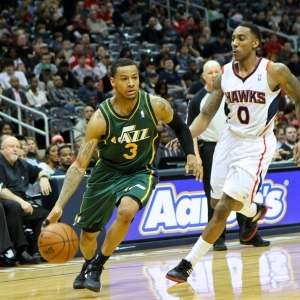 The Jazz are 3-9-1 ATS in their last 13 home games vs. a team with a losing road record. They are 0-4 ATS in their last 4 home games and are 0-6 ATS in their last 6 games playing on 2 days rest. The under is 6-1 in Utah's last 7 vs. the Western Conference and is 10-2 in their last 12 overall. In head to head matchups, the Lakers are 4-1 ATS in the last 5 meetings and are 7-3 ATS in the last 10 meetings in Utah. The under is 9-3-1 in the last 13 meetings in Utah.